The experts at the Center for Spine and Orthopedics have specialities in minimally invasive surgical procedures. Read below for information that patients can use everyday to straighten their spine and help minimize back pain. How many times have you heard someone tell you to “stop slouching” or “straighten up?” While the spine has a natural curvature, we all have a tendency to bend forward. And if you’re already experiencing back or spinal pain and pressure, becoming more aware of just how much you’re leaning or sitting at an angle can help minimize any further damage. Here are five life hacks that will help improve your posture by strengthening and straightening your spine. With our crazy, hectic lives and schedules, making excuses has become just another part of our normal routine. Something like stretching is likely the first thing to fall off your mandatory to-do list. But dedicating a few minutes each morning to a basic routine can make a big impact on how your day goes and how your spine feels further down the road too. Stretching in the morning is also a great way to wake up. After all, you’ve been on your back all night — hopefully for at least 7 to 9 hours — so your body is craving some movement. Start with a few easy shoulder rolls, and then move on to toe touches, followed by standing forward bends. End your quick routine with a full overhead stretch. To say that we’re hooked to our smartphones would be an understatement: A recent study found that the average person looks, taps, swipes, or clicks more than 2,617 times per day! What’s more, this downward motion can cause up to 60 pounds of excess weight on the cervical spine. The mere thought of disconnecting and putting your phone down may cause some panic, especially if you’re always receiving calls and messages for work or are on the lookout for one of your kids to text you. But putting your smartphone in timeout for a few minutes each day can make a difference. Start slowly, like vowing to not check it during commuting hours or not pick it up while you’re running on the treadmill. Enlist some of your family members to do the same, and have a “no phone policy” during dinner. Each time that you don’t pick up your phone is another chance for your spine to reconnect. It starts from the ground up. Your feet are the base for your entire body. Wearing loose or improperly fitted shoes can cause havoc on your lower back and spine. And don’t just think about what shoes you wear outside of the house. Consider what you keep on your feet when you’re inside too. Socks and slippers may be cozy on cold floors in the wintertime, but more supportive indoor shoes, such as those with nonslip rubber soles or bottoms, may be more beneficial for you. 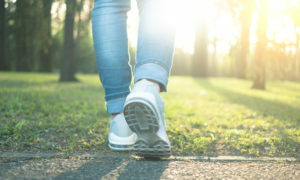 So while getting rid of your fancy red heels, those cute summer flip-flops, or even an old familiar pair of running shoes may cause some immediate distress, think of what a new pair of supportive shoes may really do for you. Some studies show that investing in custom orthotics may also be a good idea. Ask your doctor or make an appointment with a podiatrist to discuss which options may be best for you and your spine. It’s no secret that we spend the majority of our days sitting. From driving to work to sitting in meetings to grabbing lunch with friends to unwinding in front of the TV, sitting has become our natural tendency. Breaking this habit can be challenging, but setting a reminder on your smartphone may give you the nudge to get up more frequently throughout the day. Keep your back pressed up against the chair, with your lower back all the way to the chair crease. Make sure your weight is distributed evenly and you’re not leaning or slouching to one side. Keep your feet flat on the floor and avoid crossing your legs. How often do you notice your breath? Unless you’re a devout yogi or meditator, the answer is probably rarely. How deeply you breathe and how straight your spine stands are more connected than you might think. When you’re sitting or slouching, your diaphragm is constricted. This puts pressure on your chest as you inhale and exhale. But when you’re standing, you’re able to breathe through the diaphragm, lengthening and expanding the spine and allowing the upper and lower back to expand. Deeper breathing is important for not only your spine, but also your overall well-being. Research shows that it can help you feel more relaxed, reduce stress, and focus on the positive things in life. So go ahead and give it a try: Inhale, hold, and then exhale. Original article published on healthline. PreviousPrevious post:Part 3: 5 Lifestyle Steps for Better Bone HealthNextNext post:How Can I Prevent Tech Neck?